These 14 Go-To Grilling Recipes To Get Fired Up for Summer are simple enough to slip into your menu rotation and delicious enough to celebrate with friends. As soon as temps crawl north of 50 degrees, you can bet we are firing up the grill. 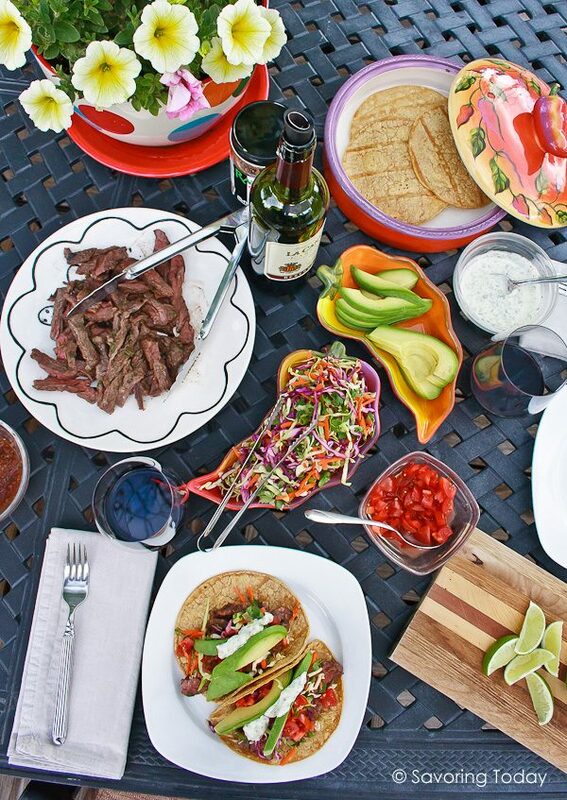 It is easy summer grilling that gets food to the table fast on busy weeknights and makes weekend parties a snap. You’ll find our favorite Go-To grilling recipes for beef, lamb, chicken and seafood, along with five sides to keep the cooking outside. That’s not all—two desserts to bring some chill to hot nights. Grilled Skirt Steak Tacos require a little advance marinating, but cook faster than any other cut of steak—only 6 to 8 minutes kind of fast. This thin strip of beef provides great-tasting steak that elevates any party menu while giving the cook (that’s you) a chance to actually enjoy the party. Click on the photo for your choice of Chile-Lime or Buttermilk Cilantro marinades. 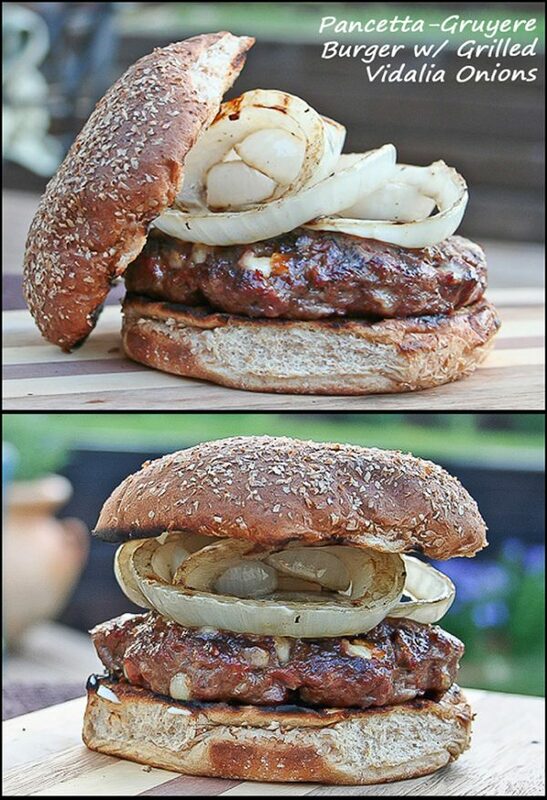 Pancetta-Gruyere Burgers with Grilled Vidalia Onions need only a toasted bun and you are ready to eat right there at the grill—no other condiments required. We mix lean pancetta and Gruyere right into the ground beef to infuse savory, juicy flavor into every bite. All burgers should taste this good. 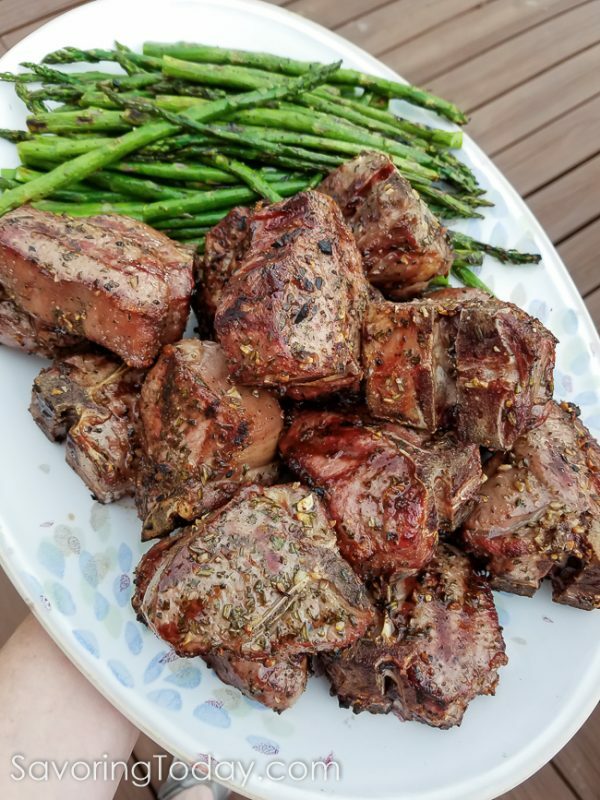 Grilled Lamb Loin Chops are my go-to for special occasions at our house. As my husband would say, “Lamb belongs on a grill.” And he’s so right! Bits of rosemary and garlic cling to the loin chops, roasting along with the meat creating a fragrant, succulent lamb dinner. It is so easy to prepare you’ll wonder why you waited for a holiday to make it. If you’re so inclined, this post includes a classic béarnaise sauce to cradle the chops in herbaceous perfection. 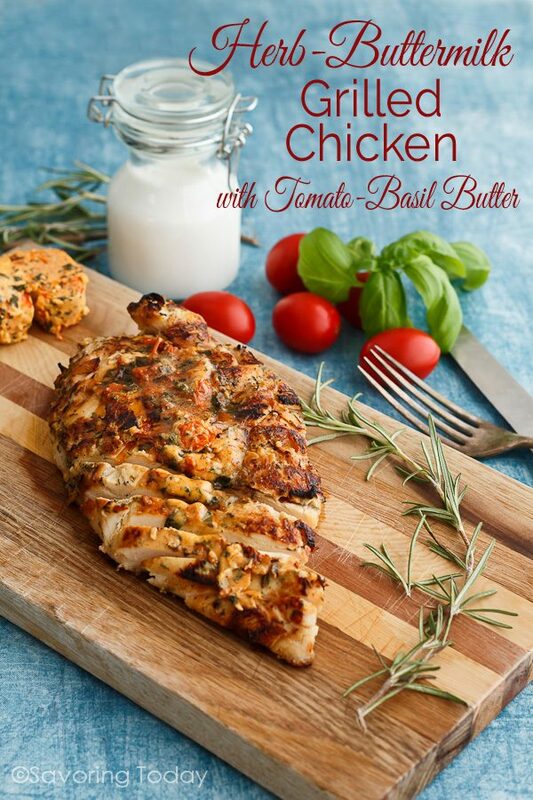 Herb-Buttermilk Chicken with Grilled Tomato-Basil Butter will leave you wondering why you ever settled for dry, boneless-skinless chicken breast in the past. Buttermilk has been a secret ingredient in the best fried chicken for as long as I can remember, and it brings its magic to grilled chicken too. Fresh herbs in the marinade cling to the chicken even when it is grilled; Grilled Tomato-Basil Butter is the perfect touch of robust flavor to finish the chicken before serving. Yeah, that’s right, I just recommended finishing your grilled chicken with butter. 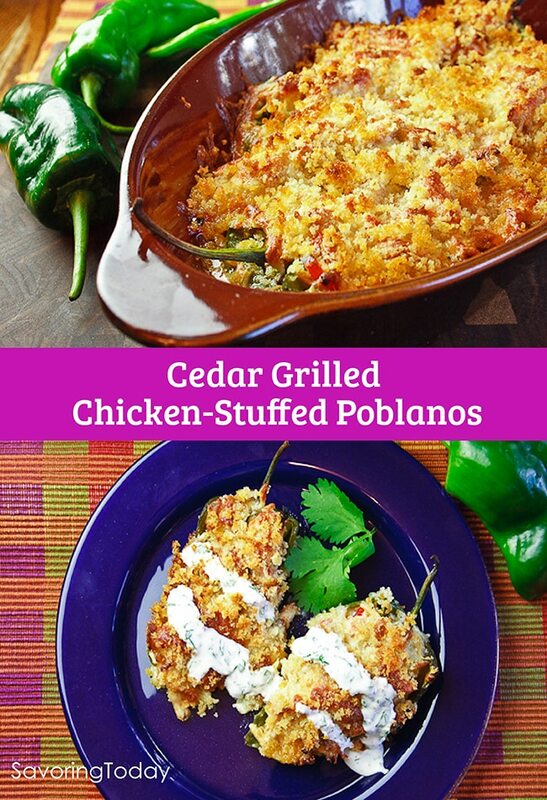 Cedar Grilled Chicken-Stuffed Poblanos makes turning the oven on in the summer worth it. If you’ve been wondering how to cook with cedar planks, look no further. While the chicken and peppers are grilled, this dish is finished in the oven to crisp up the panko topping. Roasted poblano peppers brimming with cedar-grilled chicken, cheese, caramelized onion, and christened with golden panko crumbs—really, you have to try this. 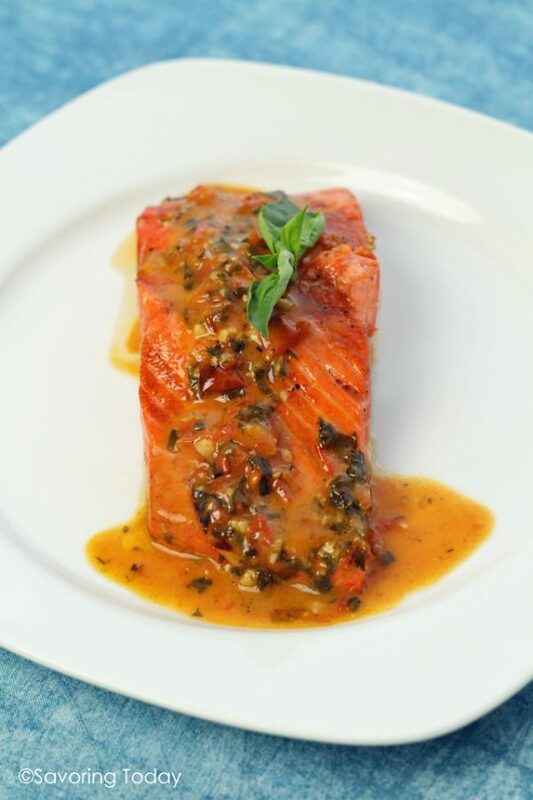 Grilled Salmon with Tomato-Basil Butter Sauce is part of a post I put together last summer with the 5 Best Fish Grilling Tips to make your best fret-free grilled fish. Grilling fish can be frustrating because it is so delicate, which is another way of saying you have a short window of “just right”. Follow these tips to ace grilled fish every time. 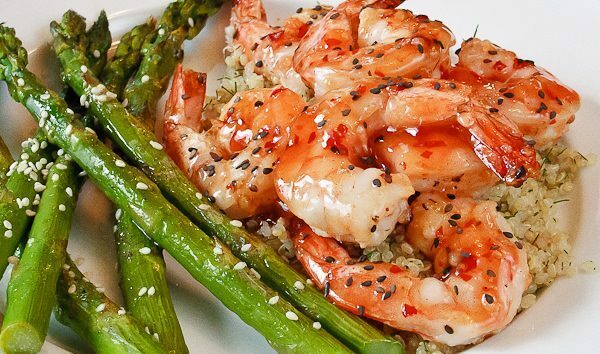 Grilled Thai Chili Sesame Shrimp makes weeknight meals a snap because it’s done in under 30 minutes from scratch. The sweet and tangy Thai chili sauce has just enough spice to grab your attention. Because it’s homemade, you can adjust the flavor in any direction that suits your family. Shrimp cooks quickly, so be sure everything is ready before you head outside to the grill and keep a close eye on it. 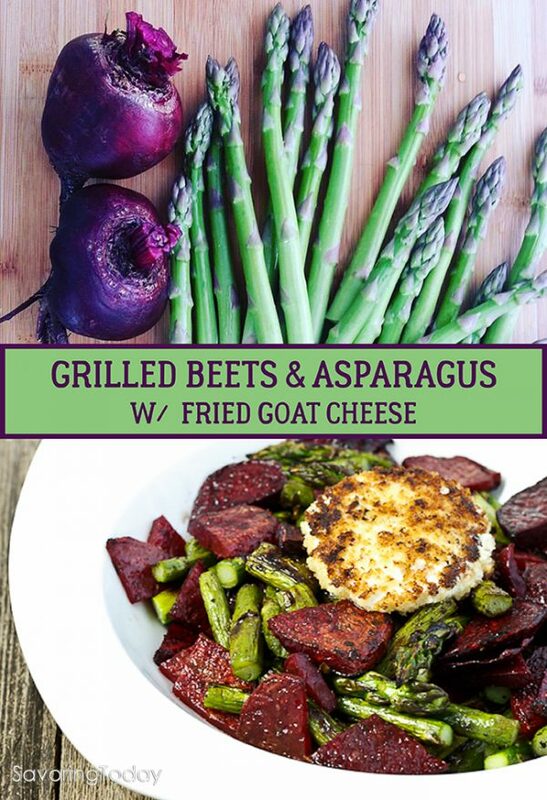 Grilled Beets & Asparagus with Fried Goat Cheese goes with anything … really. Sweet, earthy beets balance the assertive flavor of asparagus for an unlikely combination you’ll reach for again and again. You don’t have to top it with goat cheese (I can’t believe I just said that!) however, the fried goat cheese brings salt, tang and texture that makes you forget it’s actually healthy. A splash of aged balsamic and you are set to impress! 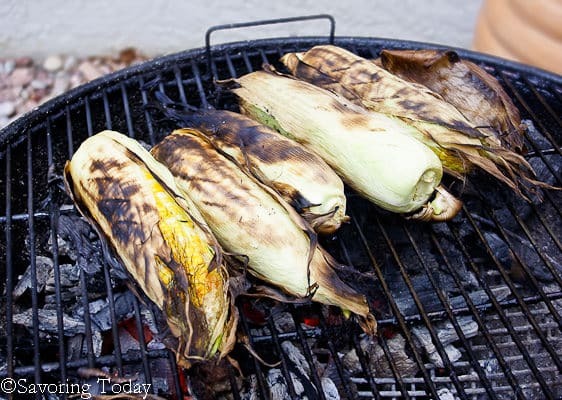 Grilled Corn of the Cob makes the heat of summer worth every drop of sweat. When we can find sweet corn locally, we enjoy it as much as three times a week because the season is brief here in Colorado. For me, I want a generous application of butter and the corn stays in the husk until it’s done—who wants dried out corn? So my best advice is to leave the husks ON and grill enough for freezing every chance you get. Don’t overlook this simple side dish, its sweet reward is summer’s best. You can always top it with garlic, cheese, or peppers if that’s your thing. Adding flavors can be fun, but best done once the corn is cooked in the husk to keep it from drying out. Then apply any flavored butters or cheese for a quick char of 2 minutes over high heat. 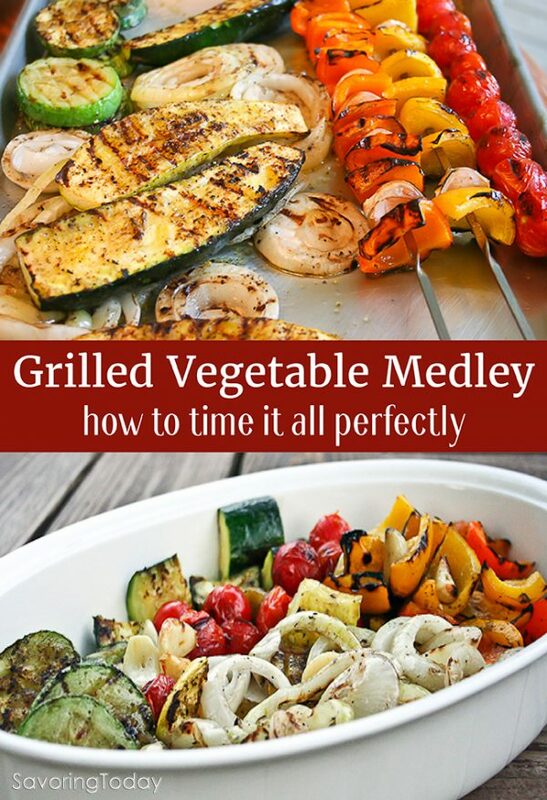 Grilled Vegetable Medley is the beauty of grilling whatever vegetables you like best. A grill tray can be your best grilling buddy for quick high-heat stir fries when you don’t want to take the time stringing skewers. And for skewer fans, the key is paring like items—tomatoes with tomatoes, peppers with peppers. Each one can be removed from the heat as needed. No one looks forward to limp squash or under-cooked onions, and you want those tomatoes charred and ready to burst. Grilled Cabbage with Classic Caesar Dressing was the single best food discovery I made last summer—think mild roasted Brussels sprouts and faster to make. 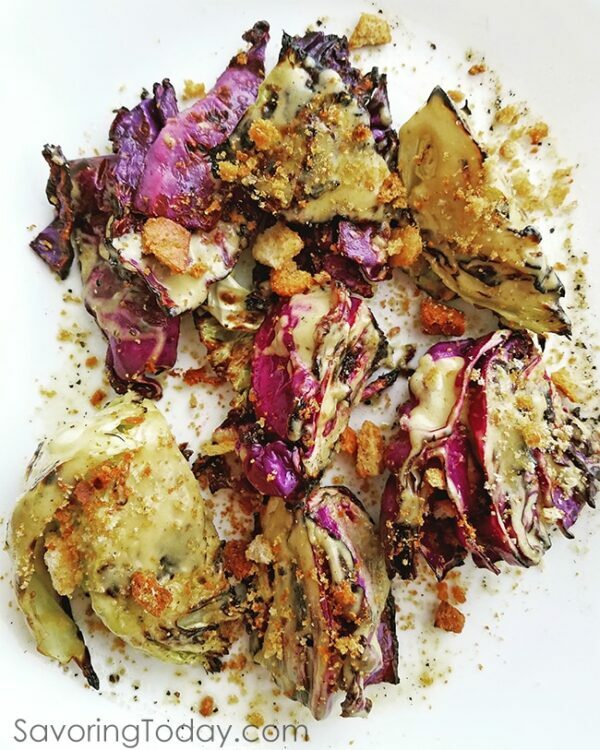 Charred edges heighten the flavor of this humble vegetable when it’s dressed up with savory Caesar and crushed croutons. 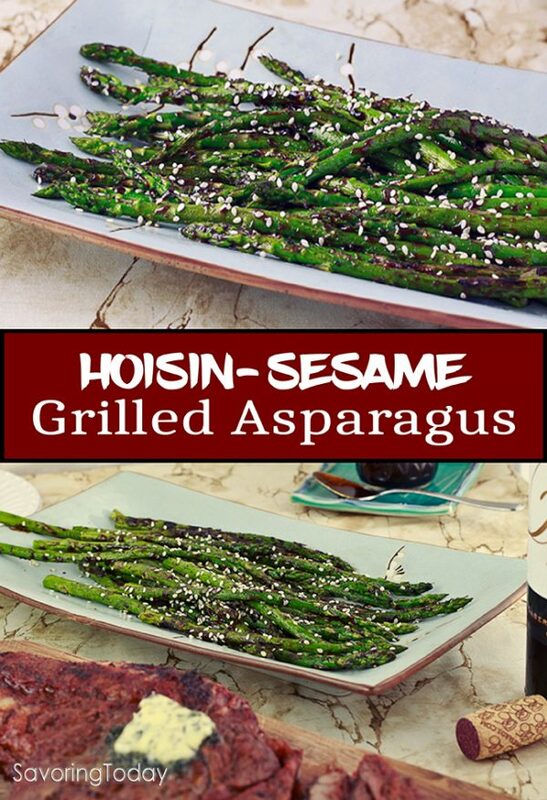 Hoisin-Sesame Grilled Asparagus is a quick, easy summer side dish from the grill, done in under 10 minutes. Hoisin sauce is widely available in stores, but this homemade version avoids common additives like caramel color and modified food starches. The sweet-savory sauce clings to the asparagus to season every bite and keep sesame seeds exactly where sprinkled. 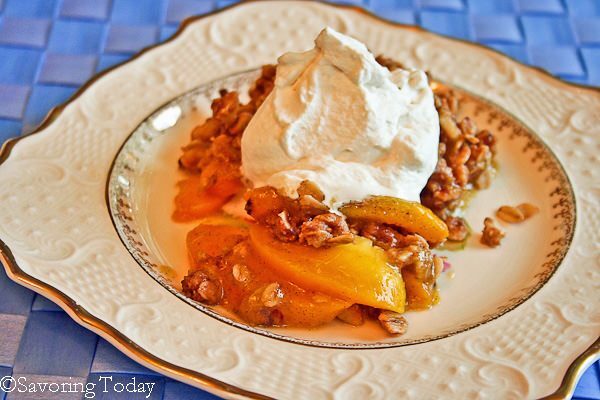 Grilled Peach and Vanilla Bean Crisp combines the familiarity of a traditional fruit crisp with the subtle smoky elements of caramelized sweetness on hot grill grates. Dessert may not be the first thing that comes to mind when lighting the grill, but sweet warm peaches and cool cream changes all that. 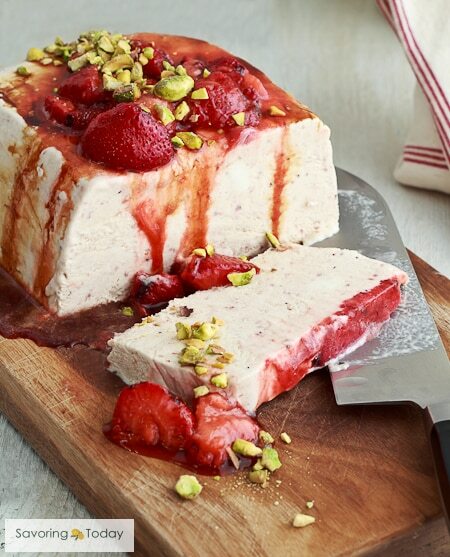 Grilled Strawberry Semifreddo with Pistachios & Balsamic is gloriously creamy, splendidly easy and always brings the WOW factor. This special Italian dessert meaning, “half cold” or “half frozen,” is similar to ice cream—sweet, creamy, luxurious—but no special equipment is required. And grilling strawberries is so easy! It is kind of funny that you’ll need a grill and a knife instead of an ice cream maker and a scoop. Crazy, I know. But Crazy good! These ideas are all perfect! I have trouble choosing one over the others! Thanks Katerina, it is hard to choose! With the temperatures we’re having right now and in the near future, grilling is going to be a must. Thanks for such a great list of ideas! Stay cool! Love grilling season! And you have so much great stuff for us to try. I can never resist lamb, and you’re right — it really does belong on the grill. Thanks! Oh, me too John, grilling season is my favorite!